Hi there! 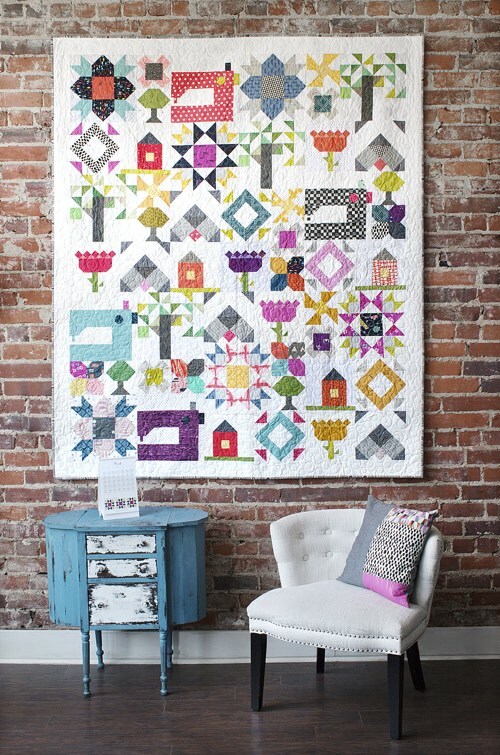 I’m excited to share a block tutorial with you today! 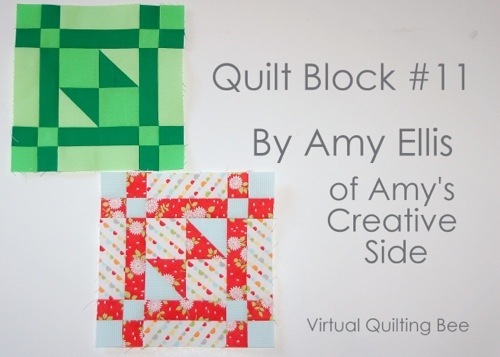 My friend, Amy Smart has been hosting a fun Virtual Bee with a great quilt in the works. 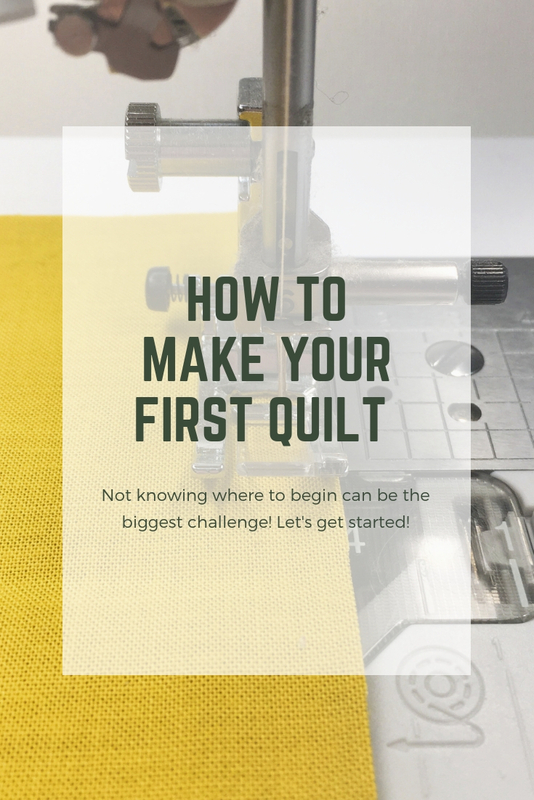 If you haven’t been following along yet, it’s not too late to join in the fun – get all the details HERE. To begin mark the diagonal on the wrong side of the aqua 3″ square. Sew 1/4″ away from both sides of the marked line, then cut apart on the diagonal. 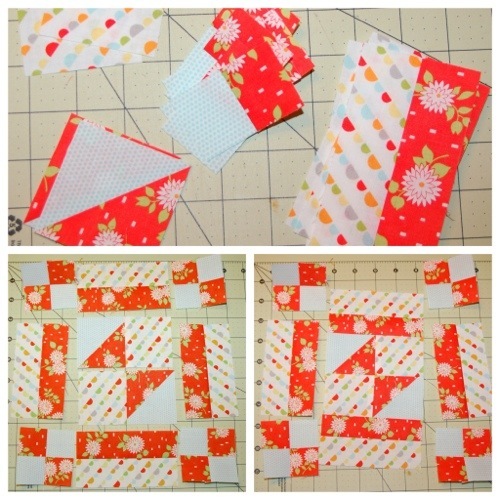 Press the seam allowances to the red fabric, then trim to 2 1/2″ square, using the seam as a guide. Also, sew the aqua and white strips each to a red strip. Press the seam allowances to the red fabric. 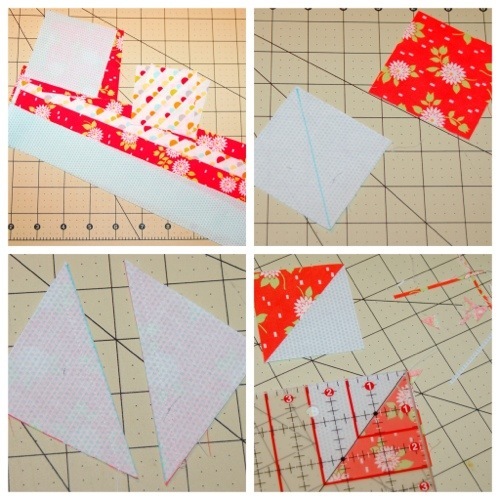 From the aqua/red strip set, cut 8 segments, each 1 1/2″ wide. From the white/red strip set, cut 4 segments, each 4 1/2″ wide. Sew 4 four-patch units from the aqua/red segments, press to one side, and layout the block as shown. 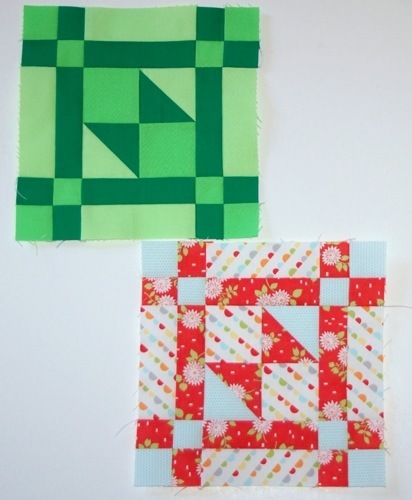 Sew the half square triangle units to the 2 1/2″ white squares as shown, press the seam allowances to the white square. 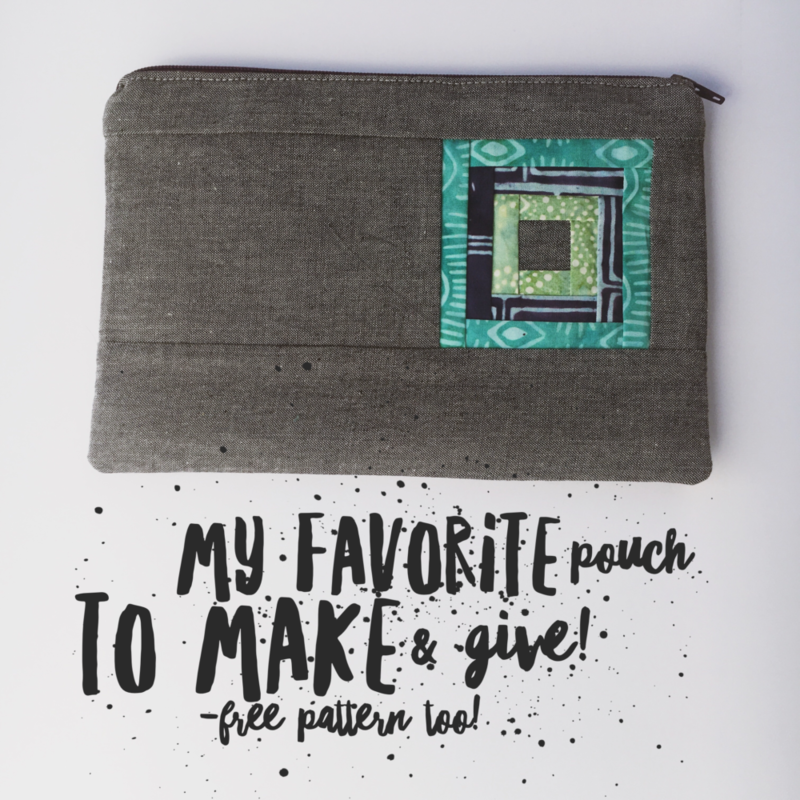 I suggest sewing the center column together, then attaching the sides, just be sure to turn the four-patch units so that the seams nest. 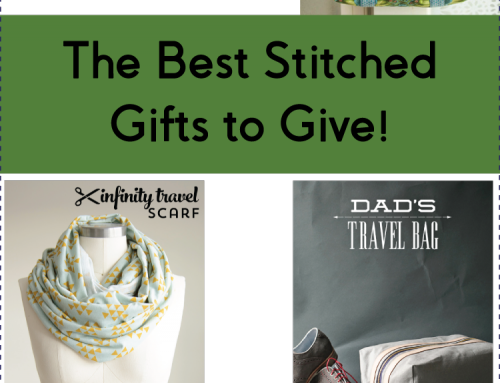 I’m not sure which is my favorite – they are both so fun! 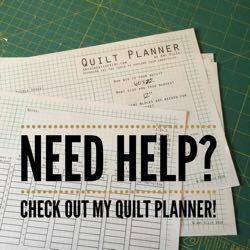 What fabrics are you using for your Bee Quilt? 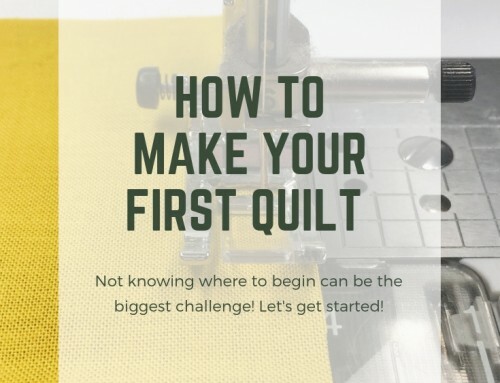 Please link up in the flickr group or if you’re on Instagram use the #virtualquiltingbee – I would love to see your versions of this block! 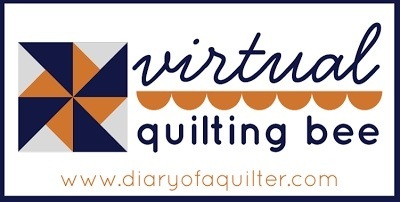 There won’t be a featured quilter this week…my laptop totally crashed, and died this week. Thankfully my husband was able to recover the files, but I’m without my usual hub of activity for a week or two. Wish me luck in setting up a replacement! Thanks for sharing! Another pretty block! 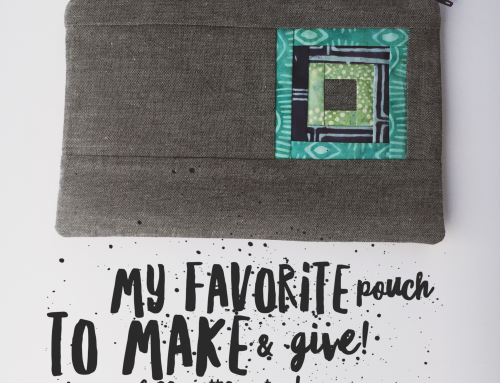 I am using bohemian festival by riley Blake, an older line. Very bright and cheerful! I think the aqua/red segments should be 2.5″, not 1.5″. 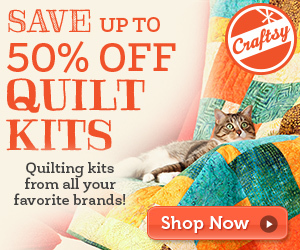 So that your 4-patch is 2.5″ square. I’m making mine from an older Moda line, “Strawberry Lemonade.” I had fallen behind for a bit but am finally caught up after this one!! Thanks for such a great block! Hi! 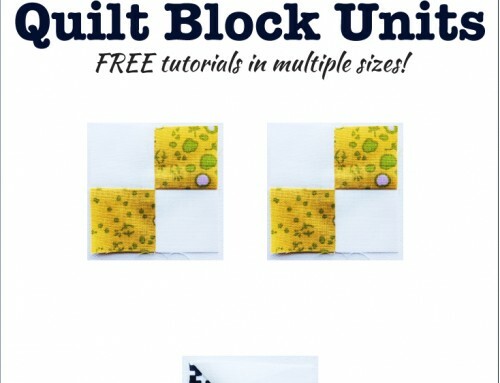 I know this is a lot to ask, but I wonder if you have the instructions for this block without the chain piecing? I’m using scraps from another project and I don’t have the lengths you’ve noted. Please let me know, ok? Thanks!